The format for the Trio league is men's and women's NTRP levels 2.5 - 4.5+. In the 4.5+ level, teams will be allowed to have two 5.0 players on their roster. Only one of those players can play in each team match and must play in the #1 singles or #1 doubles position. 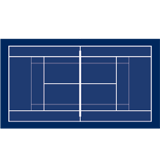 See USTA National League Regulation 2.01A. This league is designed to be a "warm up" league, so the season will consist of 4-5 weeks of matches (Note: Matches DO count toward NTRP ratings). Depending on the numbers of teams, incomplete round robins may be used, so teams could play some of the other teams in their flight more than once. Teams from this league do not advance beyond the regular season. Men's and Women's Divisions: There is one (1) singles match and two (2) doubles matches per weekly team match. Players must be at least 18 years old as of December 31 during the year of competition to be eligible to participate. Players may only play on one (1) team. USTA Colorado's League fee is $15.00 plus the Active.com Processing Fee. If you are interested in signing up for this league, you will need a current USTA membership and a team number. If you need a team number, contact your team captain or league facility coordinator at the location of your choice. Then, go to TennisLink to register. Note: If it is your first time on TennisLink, you will need to create a TennisLink account before you can register. Don't miss out on important league information. Sign up for our monthly email BLAST! and Adult League Alerts!